Here is Some Information about Tripurmalini Temple(Shakti Pith)in Jalandhar Punjab India. The Tripurmalini Shakti Pith Temple is located in Jalandhar village of punjab.The temple is dedicated to goddesh Tripurmalini .It is said that here Mata sati's breast fell that's why this pindi is covered with a cloth and face which is made up of metal which appears outside. This temple has been established so many years ago. But it became popular few years back, when people get their desired wishes fulfilled here. Now, Shri Devi Talab mandir trust placed big banners outside Tripurmalini temple so that pilgrims who reach their came to know about the past and values of it. The old structure of the Tripurmalini Shakti peeth has been renovated and changed to how it looks today. New sections have also been added within the temple premises. There is a huge tank (called talab in Hindi), as old as the main temple and is the main attraction and reason why Devi TalabMandir got its name. There is also a temple dedicated to Goddess Kali besides the main temple. Recently, a structure resembling the Amarnath Cave Temple has been added to the temple complex. According to the mythology, once lord Shiva was criticized by king Daksh in his yagna in front of mata sati. King Daksh invited all the gods including Lord Brahma and Vishnu but he didn't invite his daughter sati and her husband lord Shiva to the yagna. But still being a daughter sati went to attend his father's yagna. When Daksha saw that Sati has come uninvited he insulted her and her husband Lord Shiva. Sati was unable to bear this pain; she jumped into the yagna fire and burned herself. Lord Shiv got anger by this incidence and his third eye was opened. Angry Lord Shiva took her body on his shoulder and travels the whole universe. Mata sati's body started decomposing and parts of her body fell on earth in 51 different places. Some puran shows that number of fallen parts may be 108, 72 or 52 as well. As we know, in Tripurmalini Shaktipeeth, the breast of Mata Sati fell so it is also known by the name of Stanpeeth. Additional, It is said that resemblance of Mata Vaishno Devi, Maa Lakshmi and Maa Saraswati as well, all these devi's fulfill all desires of devotees. Just like the other Shaktipeeths, a Diya always keeps burning here as well. 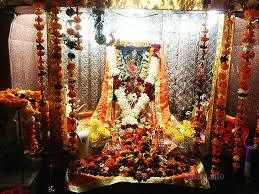 A large number of devotees mainly visit Tripurmalini Shaktipeeth on Sundays and Tuesdays. Here Goddess is in the form of Shakti. Some people believe it that whoever dies accidentally at Tripurmalini Shaktipeeth, goes to heaven after death. Even the birds or animals dying at this place gets free from taking birth again and again in this world. According to another belief, all the Gods are present here partly to meet Matarani. Worshipping here and at every shaktipeeth is considered extremely auspicious. By worshipping, we all are in safe and protective hands of Matarani. 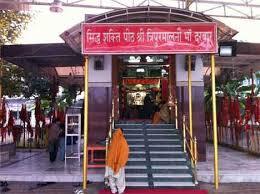 By Road : There are many privatr and public vehicels available to reach Tripurmalini Shakti Pith Temple Jalandhar. By Train : The Nearest Railway station is Jalandhar station. By Air : The Nearest Airport is Amritsar Airport. Picture Gellery of Tripurmalini Shakti Pith Temple Jalandhar. Google Map of Tripurmalini Shakti Pith Temple Jalandhar.